Let's review the best and the worst fantasy performances through Thursday and Sunday's games so far in Week 9's Fantasy Football Wrap Up. Jared Goff was able throw all over the Giants secondary, throwing for 311 yards, 4 touchdowns and 0 interceptions. Goff was able to take advantage of the Giants secondary that was without Janoris Jenkins and finished with 28.40 fantasy points. Tyrod Taylor threw for 285 yards and 2 touchdowns while rushing for 35 yards and a touchdown on 6 carries. Taylor was able to finished as the second-ranked quarterback in week 9 and scored 26.90 fantasy points. Andy Dalton could not get much going this week against a tough Jaguars defense, throwing for only 136 yards. Dalton did not throw a touchdown or turnover the ball, but finished with a mere 5.30 fantasy points. Kirk Cousins was sacked early and often on Sunday against the Seahawks which included giving up a safety. Cousins threw for 247 yards and did not turnover the ball, but failed to throw a touchdown pass. Cousins disappointed in Week 9 and finished with 8.30 fantasy points. 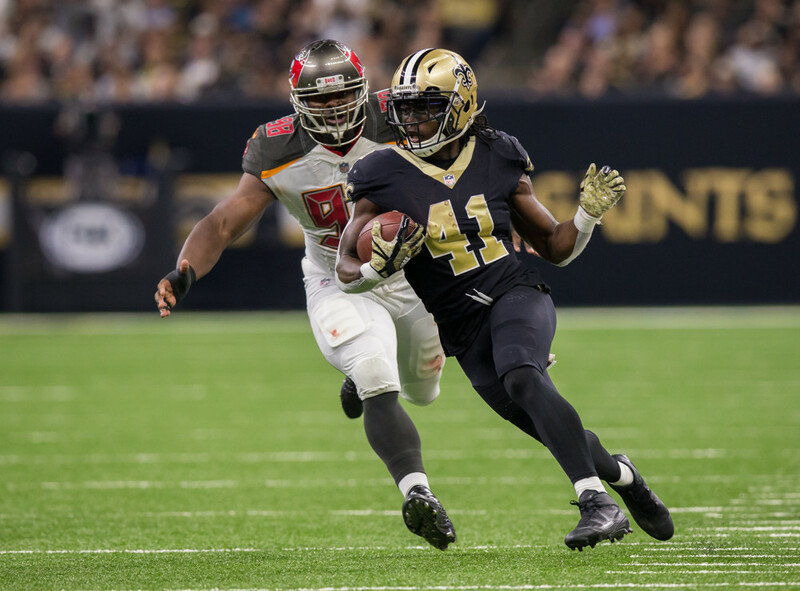 The highest-scoring running back of the week was Alvin Kamara who had quite the day against the Buccaneers. Kamara had 68 yards and 1 touchdown on 8 carries, and 6 receptions for 84 yards a touchdown. The rookie showed why he needs more and more touches each week and finished with 31.20 fantasy points. The second-highest scoring running backs of the week were Corey Clement and Matt Forte, both scoring 25.60 fantasy points. Clement carried the ball 12 times for 21 yards and 2 touchdowns and had 1 reception for 15 yards and 1 touchdown. Forte ran for 77 yards and 2 touchdowns on 14 carries while catching 4 passes for 19 yards. Doug Martin probably couldn't have had a worse week as he ran for 7 yards on 8 carries. Martin was out snapped by Peyton Barber and only managed a laughable 0.70 fantasy points. LeSean McCoy went from having 29.30 points in Week 8 to only scoring 2.50 this week - McCoy had no receptions on 1 target, and ran for only 25 yards on 12 carries. T.Y. Hilton was our wide receiver to start this week and he finished as the highest scoring wide receiver in Week 9. Hilton caught 5 of his 8 targets for receptions for 175 yards and 2 touchdowns touchdown, for a total of 36.40 fantasy points. Alshon Jeffery against the Broncos defense this Sunday, hauling in 6 receptions for 84 yards and 2 touchdowns, totaling 26.40 fantasy points. Super star wide receivers A.J. Green and Mike Evans both disappointed on Sunday and combined for a total of 3.90 fantasy points. Green decided to get ejected after only catching 1 pass for 6 yards, and his day finished with 1.60 fantasy points and a probably suspension for next week. Meanwhile, Evans should have been ejected in his matchup, but finished the day with 1 catch for 13 yards, good for 2.30 fantasy points. The highest-scoring tight end from this past week was Jared Cook, who was our tight end to start this week, and he finished Sunday's slate with the most fantasy points for tight ends with 20.60. Cook hauled in 8 receptions for 126 yards. Julius Thomas finished as the second-highest scoring tight end of the week with 6 receptions for 84 yards and 1 touchdown. Thomas finished Week 9 with 20.40 fantasy points. Jason Witten was not part of Sunday's game plan and caught his only target for 5 yards. This was the third time this season where Witten has caught only one pass and he finished Week 9 with 1.50 fantasy points. Cameron Brate recorded a season low in receptions with 1 and he was only able to convert this into 9 yards of offense. Brate had previously scored double-digit fantasy points in his previous 6 games, but this week was only managed to score 1.90 points. The highest-scoring defense of Week 9 was the New Orleans Saints Defense who held the Buccaneers to 10 points in a win on Sunday. The Saints recorded 4 sacks, a fumble recovery and a defensive touchdown off a blocked punt and scored 19.00 fantasy points. The second-highest scoring defense this week was the Jacksonville Jaguars Defense who had 2 sacks and a special teams touchdown from a returned punt. The Jags limited the Bengals to 7 points and finished the week scoring 14.00 fantasy points. The highest scoring kicker of the week was Greg Zuerlein who kicked field goals from 27, 46, and 47 yards out and converted a week-high 6 extra points. Zuerlein finished Week 9 with 17.00 fantasy points. The second-highest scoring kicker was Denver Broncos' Brandon McManus who was able to convert 3 field goals from 24, 52, and 53 yards out and kicked 3 extra points, totaling 15.00 points on the week.